Continuing our look at activities, Christina Nipper gives us food for thought: Should learning be drudgery? What’s a good balance between purposeful and playful? We’re starting a new series today focused on designing and implementing activities. Melissa starts us off with some comparisons between involvement, engagement, and empowerment. How can teachers be ministers of reconciliation when teaching a language with a history of hurt? Jacob Shylla shares from his heart about this dilemma and how he longs to build peace. 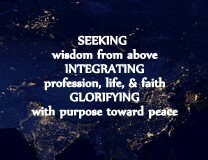 How can a teacher be a minister of reconciliation (restoring Shalom) in this life and toward the one to come? Harmony Bell Olabode gives us a thought-provoking answer that breathes peace. We’ve asked a few people how a teacher can be a minister of reconciliation (restoring Shalom) in this life and toward the one to come. Before sharing their answers, let’s first prepare our hearts before the throne in search of harmony. This week Aaron Carmichael gives us his perspective on what it means to be a teacher who follows the Master Teacher. In his “this i teach” post, he tells a story that reminds us to empathize like our Master. For the last few weeks here, we’ve been stepping toward professional development. This week we return to “this i teach,” and Jill Tyson reminds us, no matter where we are or doing what, to walk in step with the Master Teacher. It’s week 7, and we’re exploring ways to collaborate with colleagues toward growth as a teacher. It’s our final step toward professional development…in this cycle, but the journey is ongoing.